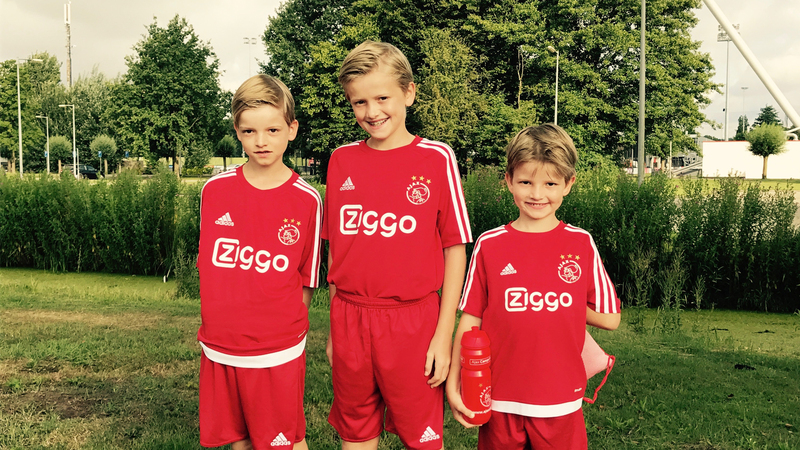 Great that you guys are joining the Ajax Camps again next summer. How many times have you guys participated in the Camps? Joris: This summer will be my third time. Otto: Lucas and I will be joining for the fourth time. For how long have you been playing football? Lucas: We all started playing soccer in Vienna around the age of five. Otto: In Vienna we used to play only once or twice a week. Now we live in Thailand and we play at least three times a week. Joris: With our school team we play soccer five times a week and if it’s possible during the lunchbreaks as well. That’s a lot! Do you play there on different surfaces? Lucas: For our club in Thailand an at our school we play on a grass pitch. In Vienna we used to play on artificial grass. Therefore, it was extra enjoyable for us to play indoor and on the street during the Ajax Camps. Joris: I really like street soccer, because it’s different than playing on grass and you really need to focus on keeping control. You can’t just sprint forward all of the sudden. Otto: Indoor is fun as well. The ball rolls faster and you need to keep control over the ball. Joris: And I like Soccer Squash! Lucas: Joris is really good at that. Do you like going to the Ajax Camps together? Lucas: The first time that Otto and I went to the Ajax Camps together, we weren’t in the same training group. We both went with a friend that year. Otto: During the second and third camp we were in the same training group, together with some other friends who we already knew from before. They were from The Netherlands, America, Vienna and Thailand. Lucas: I like being in the same team as Otto! And how was your first time at the Ajax Camps, Joris? Joris: It was pretty thrilling, but it was nice that Otto and Lucas were there as well. I joined a friend from Vienna that year. His name is Tijn and this summer we’re going to the Camps together again. Lucas: It really helps if you already know someone on the first day. Sounds good! What were the trainers like? Lucas: I was coached by coach Brent two years in a row. Brent still knew who I was the second time I was put in his training group. He even remembered my name! Joris: During my first year at the Ajax Camps, I was suffering from sore muscles a lot, which made me run less fast and shoot less hard. Coach Vincent helped me through it and that was really nice. Otto: The Ajax-trainers know really well where a lot of kids can improve and they give really good tips as well. Lucas: Yes, the Ajax-trainers are really good! Do you use those tips frequently? Lucas: Yes, we still have all of our reports and evaluations. I think it’s useful to look into them sometimes to see what I can do better. I think that helps a lot. Otto: And it’s nice to see if you shoot harder or run faster than the year before. Joris: Of course we compare all of our reports as well. Did you guys win any prizes during the Ajax Camps? Lucas: Last time we participated, I became second with the dribble challenge and I had the hardest shot. One of my friends won the dribble challenge that year. Joris: The first year that I participated my team and I won the title Team of the Week! Otto: I became second in the 1 versus 1 two times in a row. What do you like the most about the Ajax Camps? Joris: I love the dribble challenge and the way you can measure the speed of your shot. Lucas: I prefer those too. All the tests in the miCoach are super cool. Otto: The tests are my favorite part as well. They measure everything you use in a soccer match: contain focus, ball control and scoring a goal. Joris: Yes, and also the fact that you play a lot against different kids and that you want to be the best against every one of them. I just like being the best. Did the three of you went to visit the Johan Cruijff ArenA as well? Otto: Yes! Lucas and I already went to five Ajax matches. Joris went to three. Lucas: We also made a visit to the Johan Cruijff ArenA for a guided stadium tour, during the Ajax Camps. It was cool to sit on the substitutes benches alongside the pitch. Joris: I mainly liked to see the dressing room of the Ajax-players, with the lights and the names of the players above their seat. Lucas: And it was cool that we went on the pitch, while the Ajax-anthem was playing. Joris: It was a bit like the opening ceremony at the Ajax Camps! Thank you for the interview guys. See you this summer!